Jian is the king of the short weapons. Skill in the use of the Jian is built on a foundation of skill with the saber, which is called the root of the short weapons. Any martial artist who wants to master the Jian should first master the saber; otherwise it will be extremely difficult to understand the applications of the techniques and the source of the power in sword practice. Although the saber is the root of the short weapons, its techniques and power applications are very different from those of the sword. For example, the saber uses muscle power. 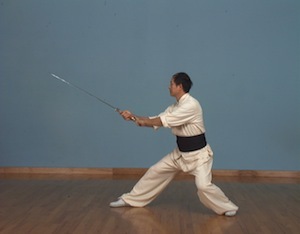 The blunt edge of the saber is designed for blocking vigorously, but this action cannot be done with the Jian. Since the sword is double-edged, using either edge to block will dull the blade. With the sword only the third of the blade nearest the hilt is designed for vigorous blocking. The sharpened part of the blade should not be allowed to contact the opponent’s weapon. Therefore, a defensive attack without blocking is the best sword technique, and a sliding block followed by an attack is the second best. The least desirable defense is to block using the blunt area of the blade. The fighting strategy is also different between saber and sword. The saber fighter will try to keep the enemy in the short and middle range in order to take advantage of the saber’s vigorous blocking and attacking power. To do this the saber fighter always uses two hands together. One hand holds the saber while the other is used for coordination and balance or to grasp the enemy’s wrist, arm, or weapon. The Jian fighter, however, tries to keep the enemy in the middle or long range in order to be able to use the razor sharp tip of the sword effectively. In addition, by keeping some distance from the opponent it is easier to avoid violent attacks. For applying power the saber relies on muscle power, while the Jian uses muscle and internal power (Qi) together in order to defend against a heavy weapon or a strong attack. Because of the more refined power needed, the sword needs more technique, more skill, and more training time. Even though there are so many differences between the saber and the sword, the saber is still the foundation of sword practice. It builds up the stances, dodging, and the basic forward and backward movements. It also builds the muscles required for sword practice. Most important of all, practicing the saber will help the student to understand in general the application and the fighting strategy of short weapons. Mastering the sword requires learning to project power into the weapon, but if a person generated power only on one side of the body, disorders would result. To avoid this, sword practitioners hold the empty hand with the index and middle fingers extended and the thumb folded over the other two fingers. When power is extended into the sword, it is also projected from the extended fingers of the empty hand to balance the energy. This is known as the secret sword. It is also used for applying cavity press when appropriate. There is also an open hand secret sword, which is occasionally used in some styles, primarily those in which muscular strength dominates the sword application. There are two basic ways to hold the sword: left-handed and right-handed. 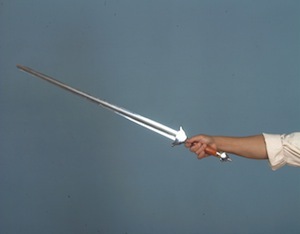 The left-handed grip is used at the beginning of sequences, for defensive blocks, and to hold the sword while the right hand is used for a cavity press. The right-handed grip (Figure 2) is the usual grip for using the sword. The correct tightness must be maintained. If the grip is too tight you will lose flexibility and inhibit energy flow. If the grip is too loose, it is easy to be disarmed. The sword should be held like an egg, neither broken nor dropped. The grip should be alive. There are eight fundamental stances in Shaolin Long Fist Sword. The student should become proficient in every one. Each style of Gongfu has its own characteristic stances, and there are variations. Only Northern Shaolin Long Fist stances will be discussed here. It is important to understand that the basic stances are the foundation of the techniques. If the foundation is not firm, then the techniques cannot be performed properly, for they will be unstable. It is the leg forms that are important in the illustrations; the hand forms can vary for the same stance. The Horse Stance (Ma Bu). This stance (Figure 3) is the most fundamental and is especially valuable in building up the strength of the knees. To assume this stance, place the feet parallel slightly beyond shoulder width. Bend the knees until a 90-degree angle is formed between the back part of the calf and the thigh, keeping the back straight. It is important to concentrate on directing the power of the legs straight down and not to the side, as if standing on stilts. The knees should not bow out, but should be turned slightly inward. To practice this stance the student should begin by standing straight with both feet together and jump into the horse stance. The beginning student should try to maintain the stance for at least five minutes, but no longer than ten. The Mountain Climbing Stance or Bow and Arrow Stance (Deng Shan Bu, Gong Jian Bu). This stance is one of the most commonly used offensive stances. About 60 percent of the weight is on the front leg and 40 percent on the rear. The front knee is above the toes and the back leg is straight. The front foot should be turned inward about 15 degrees and the hips should face the direction of the forward leg. The Crossed Leg Stance (Zuo Pan Bu). This stance can be used either for attack or defense. To assume this stance first stand in the Horse Stance. Raise the right toe while pivoting on the right heel. At the same time, turn right until the body is facing to the rear. During the turn the left foot pivots and turns on its toe. Bend the knees until the left knee is about one inch off the ground. In this final position the right foot is flat and the left is on its toes. For turning to the left reverse directions and weighting. The Four-Six Stance (Si Liu Bu). This is one of the most versatile stances in Wushu. (Figure 4). From this stance, the martial artist can switch into various techniques with relative ease. In this stance, 40 percent of the weight is on the front leg, while 60 percent is on the back leg. The knee of the front leg should be turned slightly inward and bent. Never straighten the knee in this stance, because if a kick were to land on the stiffened knee, it could easily break it. The front foot should be at a 15-degree angle inward. In addition, the back knee must be flexed and turned inward toward the groin. To change into the Four-Six Stance from the Horse Stance, turn the body to either direction so that the back leg holds 60 percent of the total weight and the front has 40 percent of the weight. The Taming the Tiger Stance (Fu Hu Bu). 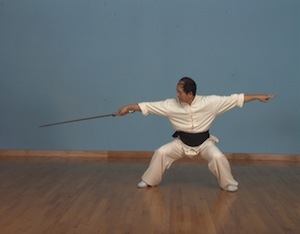 This stance is generally used as a defense against high attacks. This stance has a particularly interesting origin. During the Song Dynasty (A.D. 960-1280) a famous hero named Wu Song was suddenly attacked in the jungle by a huge tiger. As the tiger leapt at him, Wu Song drew his only weapon, a small dagger, and bent low to avoid the leaping tiger. While the tiger was hurling over him, Wu Song stabbed the tiger in the belly and killed it, thus taming the tiger. To assume this stance, begin by standing in the Horse Stance. Then squat down on the left leg until your thigh is parallel to the ground. The right leg should be extended straight out to the side. Both feet must be planted flat and the back is kept straight. Repeat on the right leg. The Golden Rooster Stands on One Leg Stance (Jin Ji Du Li). This stance is generally used to set up for quick leg attacks. To assume this stance raise one leg until the knee is as high as possible. The False Stance (Xuan Ji Bu, Xu Bu). This stance can be used for quick kicking. To assume this stance, place all the body’s weight on one leg and lightly touch the ground with the toe of the other. To change legs, turn the body 180 degrees while shifting the weight from the rear foot to the front foot, which becomes the rear foot. Make sure the lead leg has no weight on it. The Unicorn Stance (Qi Lin Bu). This stance is another extremely versatile stance; the martial artist can easily move backward while having the ability to kick from the rear leg. The name of the stance comes from the belief that a unicorn had to bend its knee in order to bow. To assume the stance, start in the Horse Stance. Next, place the right leg behind the left leg. The knee of the right leg should be one inch above the ground and behind the left ankle. The right leg is on its toes and is at a 90-degree angle to the left foot. The left leg has about 80 percent of the weight. This stance is commonly used for withdrawal. Reverse this process for the other leg.